CHICAGO--(BUSINESS WIRE)-- Hyatt Ziva Cancún opens its doors in one of Cancún’s most pristine and exclusive beach locations, Punta Cancún. Surrounded on three sides by the Caribbean Sea, the 547-suite Hyatt Ziva resort has undergone an approximate $85 million expansion and renovation creating a new luxury all inclusive experience for guests of all ages. The resort is owned by Playa Hotels & Resorts and will be managed by Playa Resorts Management, the operational component of Playa Hotels & Resorts. Renowned Mexican architect Ricardo Legoretta designed the original resort building that has been incorporated into the new Hyatt Ziva Cancún. The iconic design exemplified the contemporary Mexican architecture that came to define the development of Cancún and other Mexican beachside resorts. Respecting and maintaining its classic pyramid-style architecture, the resort has been expanded and reimagined to create an atmosphere that reflects the culture of the Yucatan. A bridge connecting the north and south beach provides guests easy access to both beaches, as well as entertainment, dining, and other resort features and amenities. Guests are welcomed into an elevated lobby that captures ocean views to the northeast, and in the evening, the lights of Isla Mujeres. The lobby is a blend of contemporary design juxtaposed with the original Mayan materials and themes. For example, one side of the lobby’s facade is local coral stone while the opposite side showcases modern glass cubes wrapped in a matrix of latticework simulating windswept driftwood. The resort’s furnishings are made in Mexico from local woods and fabrics, and the use of bright color accents adds Mayan detail. The Lobby Bar pays homage to Mayan culture with its geometric artwork and panels influenced by indigenous carvings and the language of the area’s original inhabitants. A signature grand staircase is the focal point of the resort and becomes seating for the outdoor amphitheater hosting special events in the evenings. Each of the resort’s 547 guest suites offer views of the Caribbean and the lavish resort gardens, furnishings reflecting the colors of the Yucatan with surprising accents such as butterfly inspired lighting and spa-style bathrooms with soaking tubs. All guest suites are designed with technology in mind to provide one touch lighting efficiency, and guests may also enjoy complimentary in-room refreshment bars, in-room dining service, and for upper-category accommodations, they can enjoy swim-up suites and private butler service. Hyatt Ziva Cancún also offers an exclusive Hyatt Club Level with a private lounge and concierge service. Hyatt Ziva Cancún elevates the traditional all inclusive dining experience with a choice of nine restaurants and six bars and lounges. With a wide selection of fresh and seasonal cuisine, guests can dine internationally with choices ranging from a French brasserie to an Italian cucina, to an Asian-infused sushi and teriyaki restaurant to a beachside taquería and ceviche bar. For casual dining, guests can enjoy an American diner and a gourmet buffet restaurant with engaging show-cooking stations. Unique refreshments are available around the clock at the coffee house, the sports bar and other lounges with signature cocktails and expert mixologists. Additionally, Hyatt Ziva Cancún offers an onsite microbrewery and sports bar, Très Cervezas, which showcases three high quality, innovative and unique beers made by head brewmaster Juan Jose Garcia. The craft beers will be served throughout the resort. For recreation, Hyatt Ziva Cancún offers lagoon-style pools with swim-up bars, an adult-only pool, a lounge with game tables, and one of the area’s largest ocean view fitness centers complete with 14 treadmills and an expansive machines/free weights zone. The Spa is breathtaking with a signature hydrotherapy area facing the sea, 13 treatment rooms and an additional five palapas on the beach for massages. Families will enjoy the KidZ Club with its own club house and play area with supervised activities and learning experiences for children ages 4-12. Hyatt Ziva Cancún offers state-of-the-art meeting and convention space, with more than 11,000 square feet of flexible meeting and event areas, including a ballroom that can be divided into five breakout rooms, plus seven additional meeting rooms. The resort also features outdoor lawn, garden and beach venues with breathtaking views that create the perfect backdrop for weddings or other special occasions. For more information on Hyatt Ziva Cancún or to make a reservation visit: www.allinclusive.hyatt.com, call +1 800 760 0944 or contact your preferred travel agent. Join the conversation on Facebook, Twitter and Instagram, or tag photos with #HyattAllIn. Hyatt Ziva Cancún is owned by Playa Hotels & Resorts B.V. and managed by Playa Resorts Management, the operational management component of Playa Hotels & Resorts. Playa’s portfolio consists of a collection of 14 premier hotels comprising 6,142-rooms that are located in prime beach locations in Mexico, the Dominican Republic and Jamaica. 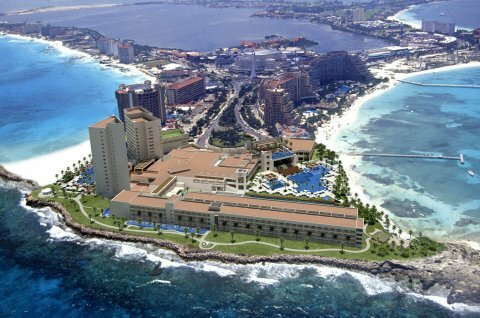 Playa owns and manages Hyatt Ziva Cancún, Hyatt Zilara Cancún, Hyatt Ziva and Hyatt Zilara in Rose Hall Jamaica, Hyatt Ziva Puerto Vallarta and Hyatt Ziva Los Cabos. The company also owns and operates 3 resorts under Playa’s brands, The ROYAL and Gran, as well as 5 resorts in Mexico and the Dominican Republic that are managed by a third party. Under an agreement with an affiliate of Hyatt Hotels Corporation (NYSE: H), Playa will pursue the acquisition or development of new all-inclusive resort opportunities under two new Hyatt all-inclusive brands—Hyatt Ziva and Hyatt Zilara. Playa will also have certain rights to operate Hyatt-branded all-inclusive resorts in five Latin American and Caribbean countries. For more information visit: www.playaresorts.com.